With Christmas coming up fast, its getting near to the time to be getting the decorations down from wherever you had them stored all year and start putting them up around the house. Of course that includes your Christmas tree if you have an artificial one stored away neatly in its box from last year. That's one of the real plus points about artificial Christmas trees in that you can reuse them year after year making the initial price you paid more than worth it for the value the tree brings. This solidifies the eventual saving over the cost of buying a real one each year plus the cost of transporting it home and then to the dump when the holiday is all over. If you have a place reserved for the tree that is the same for every year, it makes life easy because you don't have to go rearranging furniture to fit the tree in each time. Let's take a look at some of the more popular alternatives. There are always great places in a certain room to put your most important festive decoration, but if you haven't already figured one out for your home, here are probably the most common places to put it. Don't laugh out loud at that last point. You'd be surprised at how many people actually place their tree right in the center of the room and make it a fabulous centerpiece! 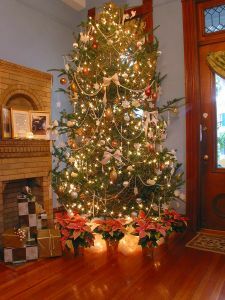 It is quite common to place a tree by the front window looking out into the street. This not only has a practical side, since that part of many living rooms is not really used for much else, but it also provides a glimpse of how great your tree is to passers by! Many rooms have suitable recesses or alcoves, such as by a fireplace for example. These provide the perfect place for a tree as it can be a prominent feature in the room without getting too much in the way of normal life. Then there is the good old corner spot for the tree. This usually happens when the room is small and there isn't much free space to put a tree anywhere else. Often specialized corner or half shaped trees make perfect fit in these situations, or a nice slim pencil tree can make a bold statement without using much of that valuable space! Where to put it is usually down to personal choice, unless your space is limited, as in a small apartment or condo and you really only have the one allocated place for it. Most people have a place in mind before the tree even enters the house, so the designated spot will have already been pre-planned by the homeowner. But wherever you put it, make sure it's the focal point of the room. That's because during the festive season, it is by far the most important decoration in your home!